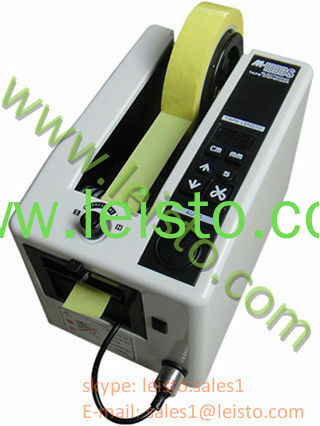 Automatic teflon tape dispenser M-1000S can offer one piece of tape at one time automatically and quickly. The operators can set the required length easily. It can save the cutting time and improve the working efficiency. It can also set as “manually offering tapes”. The cutting length is from 5mm to 999mm and the cutting width is from 6mm to 60mm. The Min length is 5mm. •Only need to stick the tape tip to the outlet, then the tape at a required length will come out automatically. •Auto mode and Manual mode is selective, in Auto mode, it will cut tape automatically. •When a long tape is needed, keep pressing "FORWARD" key to the desired length, then press "CUT" key. •The cutter unit cassette can be removed and replaced easily (tape jamming can be also easily fixed). •The cutting length is shown on the LED display, you can set the cutting length easily by "CM" and "MM" key. •Available tape type: PVC tape, paper tape, cloth tape, glass tape, pp tape, kraft adhesive tape ect. •Freature: Can cut very slim tapes, min. tape width can be 5mm! Other functions are similar to M-1000.